The Panthers are excited to announce that our 7-8th graders – now called U14 – will team-up with Liberty to play this season. 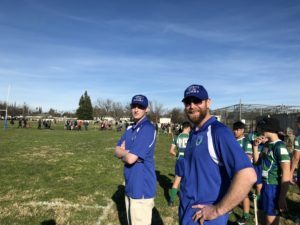 After a fantastic experience at the Sacramento Kick-Off Tournament (KOT) (where the boys from both teams teamed up to win all their official games! ), we are excited to team-up again with the Liberty boys and their coaches, Kirk and Tyler. We’re looking forward to a fantastic season with them! Last week-end, our 7-8th graders went down to Sacramento to participate in their first out-of-state tournament. 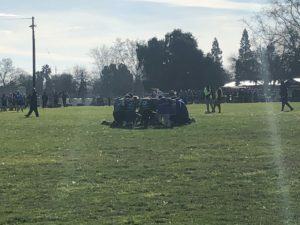 They joined Liberty Rugby to form a team competing against a number of California teams in the KOT (Season Kick-Off Tournament). We had 7 players from the Panthers and 6 from Liberty, with a few addional players borrowed from local teams, as well as from Liberty’s girls team. 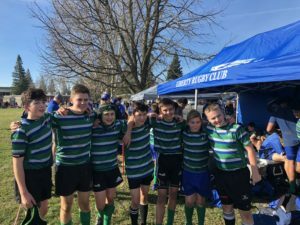 As coaches, we were anxious to see how our boys would do in California, where Rugby is much more developped, and we were very excited to see them perform very well compared to the other local teams. We played 3 official games on Saturday, and another 3 on Sunday, plus some extra game time with other teams who needed reinforcement. When attacking, the Liberty-Panthers team executed the plays they had worked on at practice with remarkable confidence, even against a strong defense. They alternated forwards sequences with wide plays, and the ball went all the way to the wing more often than not, thanks to strong passing and well timed runs in the back line. The forwards did a great job putting pressure on defense, and creating the space for our centers to break through on 3rd and 4th sequences. In Defense, the boys showed skill and mental strengths, with some big tackles against strong opponents. They stayed organized, and kept control of the game even under pressure from the bigger teams. Most importantly, the coaches did not say much from the sidelines. The boys self-organized, corrected their weaknesses, communicated well together, and supported each other efficiently, demonstrating how mature they have become. Liberty and Panthers coaches were very impressed to see them work together so well only after 4 joint practices. – Cole had a tremendous impact in attack using his power but also his agility to pierce defense and score several decisive tries. He alternated impact and well-timed offloads to team mates, further destablizing defense by being very difficult to read. He also set the tone in defense as usual with his impressive tackling skills. – Cody had a tough job with some big players to keep in check, and was instrumental in our attack with solid rucking to consolidate our sequences of forward plays. He also put pressure on the opposing team in defense around the breakdown, and did all the tough work forwards do to allow our backs to shine! – Mathis was his usual self, setting the tone in attack and in defense with an aggressive Rugby, fighting on each play to press forward with the ball, or pressure opposition in defense. He was key in many line runs with very nice offloads to support players, and of course, scored some memorable tries. – Alexander had an outstanding 2 days on the field, and was voted the best tackler of the team by his peers. Again, comments from the sidelines were priceless: ‘How does he do that?’ when tackling a player twice his size! His impact in the line was also decisive, as the ball got to him at the end of back lines for several classic tries. – Eliott played fly-half for the first time in official games, and did an amazing job launching the back line with great decision making and superb passing. He quickly adapted to the position and directed many of the plays between forwards and backs, working well with Magnus (scrum-half). And of course, he couldn’t resist scoring a try stealing a ball from an opposing team for one his typical ‘Eliott plays’! – Patrick was with us but unfortunately was sick with the flu and could not participate, but I want to mention him as he worked hard to prepare this tournament with us, and these efforts will payoff as we team-up with Liberty for the rest of the season. Most importantly, the boys had a blast and bonded strongly with the Liberty players, who I did not name individually, but who all deserve to be recognized as well for their spirit, their skills and their big heart on the field. I want to command coaches Kirk and Tyler from Liberty for their coaching. In only a few joint sessions they put together a very strong team which consistently played a good rugby over the 2 days. It was obvious we had one of the best trained team in the tournament. Finally I want to thank Sophie and the Liberty club for organizing this trip, and the coaches who helped coach prior to the trip and travelled to Sacramento to support the team. This is definitely an event we want to go to again next year!